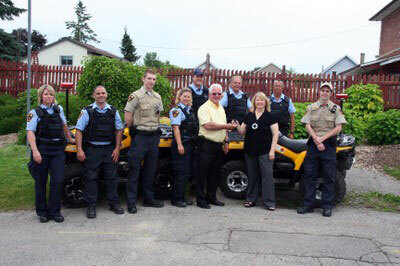 The City of Kawartha Lakes Municipal Law Enforcement Office is pleased to announce the generous donation from the Kawartha ATV Association (KATVA) of an ATV for the use by Municipal Law Enforcement Officers to patrol the Victoria Rail Trail. Another ATV was recently purchased providing two machines for enforcement. Photo (l to r): Stacey Collins, Terry Hickey, Jacob Bartlett, Jenn Toste, Aaron Sloan, Gord Garfield (Manager), Bob Low, Carolyn Richards (Vice President KATVA), Craig Weekes, Brent Mace.